I had been looking forward to the good food and wine festival in the exhibition centre in Sydney for more than a year, since I found out after my visit of the same event in Melbourne last year that there is also an instance in Sydney. Good food, wine, can it get any better? I must admit that this year skipped the food almost entirely and fully concentrated on the wine. Wineries from all the important wine regions of this country were offering tastings of their products. I tasted a considerable number of red wines and later on the tasting became more of a wine drinking session, which was only interrupted by half an hour of Gordon Ramsey in the Diners Club theatre. Rather atypically not more than a few swear words passed his lips. I enjoyed the short show, and the prepared lamb on salad bed with soup and the desert prepared from old brioche, egg and passion fruit looked very appealing – not only because I was quite hungry at that stage. The main problem all these wines is that they are priced well above my standard budget for wines and I am therefore not very likely to buy them too often. A more affordable wine I liked a lot was the 2005 pinot noir from Graeme Miller Wines. We concluded this day of indulgence in the Rocks, the small Japanese place (Nakashima) was an excellent choice. Very good value, friendly service, great atmosphere. The Sukiyaki was terrific! I am definitely going back there another day. This entry was posted on June 23, 2008 at 5:58 pm and is filed under Dining in Sydney, Food and Wine. You can follow any responses to this entry through the RSS 2.0 feed. You can leave a response, or trackback from your own site. Is there anywhere Ramsey has not conquered? 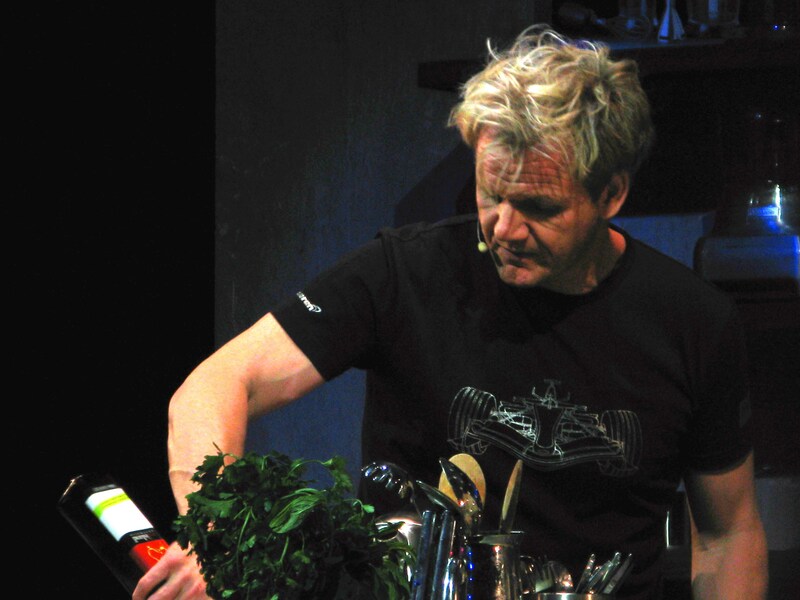 I did not really know much about Gordon Ramsey before the show, mainly because I am almost never sitting in front of the TV…but judging from the reaction of the crowd he has definitely conquered Sydney too! And I did understand why, he did a fine job. I worked at that festival when I was still in the wine industry (now I just write about wine). It was a slow session and the organisers didnt want Mr Ramsay getting upset that he wasnt as popular as he thought he was so they gave out free session tickets to the stand holders. He was immaculate in that kitchenette with the food, was quite funny. I remember the food was kind of simple. Although he knew little about wine and what he was talking about.